Note: I found this draft and saw it was dated from 10/4/11. As I reread what I had written two years ago, I realized that not much has changed, so I added to the original few paragraphs. Why do my children only breakdown at home or with me and Jeremy? Why do they throw hysterics only with me? Why do they think I’m better apt to deal with the drama? Because in reality, I hate the drama! Take your drama somewhere else, kiddos! Now I know that my kids just feel comfortable around me so they can show their true feelings. And I should be thankful that they are wonderful with others, especially other caregivers and family members. But the drama is driving me crazy. When I first started this post 2 years ago, I imagine I was mostly thinking of my then almost 6-year-old daughter and her drama. And I’m sure I was thinking my then 3-year-old son was fine. Oh wait, he was three, so probably not. I really was going crazy. And now I have an almost 8-year-old daughter and a 5-year-old son, and the drama is still here. Sorry other parents with younger kids thinking you will get through this “phase.” It’s just meant to be. Kids = Drama. The main drama we see these days is homework drama, time-out drama, getting hurt drama and woe-is-me drama. Mason hates doing homework. Actually she doesn’t totally mind the math and spelling. But she hates having to read. My mom says I was the same way. It’s like pulling teeth to get her to sit still for 15 minutes to read. I know I shouldn’t compare her to other kids, but I know other 2nd graders already reading long chapter books and going through them one a week. We’re lucky if we finish a basic chapter book (like Ramona or Ivy & Bean) in the 3-week time we have before the library books are due. I keep thinking that if Mason finds something that is intriguing to her, she’ll get into it. So we’ve tried many different book series. Still nothing is keeping her attention enough for her to WANT to come home and read a book. While I may have been the same when I was her age, I don’t remember it. Now, I get into my books (chic lit) so much that I am eager to get to bed early each night so I can read some more. It’s hard for me to understand her not wanting to see how the book continues each day. Cooper doesn’t have homework right now, but even if I just try to get him to show me the letters he was working on at school or to find sight words in books, he usually is pretty vocal about it. As for time-out drama, I’m sure this is the same for every parent (or at least I hope so!) We still try to do the 1,2,3 Magic system where they get warnings of 1 and 2 before a cool down period at 3. Even with the warnings, they are completely upset and shocked when we get to a 3 and tell them to go to their room for a cool down period. Drama ensues and then not only have they been put in time out, but they also lose certain things like screen time or a bit of their allowance. No matter how calm we stay through it, their drama fills the house! Finally is the woe-is-me drama. We really thought this was a girl thing. When Mason did it when she was 5, we assumed it was part of her over-the-top, trying to get attention with anything self. We got through it with a lot of conversations and calming. But now Cooper is doing it. It must be a 5-year-old thing. If we ask him not to do something or if he gets in trouble, he’ll start on it. “Everybody hates me.” “I’m the worst person ever.” “You hate me and don’t love me.” Obviously we never say anything like that to him, so I have no idea where he is getting it from (or where Mason got it when she was his age.) It breaks our hearts to hear it, and we actually make a big deal out of it and try to have serious conversations about it. Self-esteem is so important for young kids, and I never want them to feel bad about themselves. We keep telling them that everyone makes mistakes but that never makes us not love them or that they are a bad person. It’s exhausting just thinking about it. So there you have it. The drama in our house. Not the most fun read, but just a glimpse into our lives. Perhaps other parents out there are having the same issues and think they are the only ones suffering. Especially when most kids act completely normal around other kids and families and only save the drama for home, it’s hard to believe others are going through the same until you hear their stories. My dad used to have a sign posted in our basement with the red slash through the word “whining.” I definitely need that for the word “drama.” I just don’t want it!!! Wow, I am really do bad at my “once a week” blogging goal, aren’t i? So sorry about that! Fall easily becomes one of our busiest times of year. 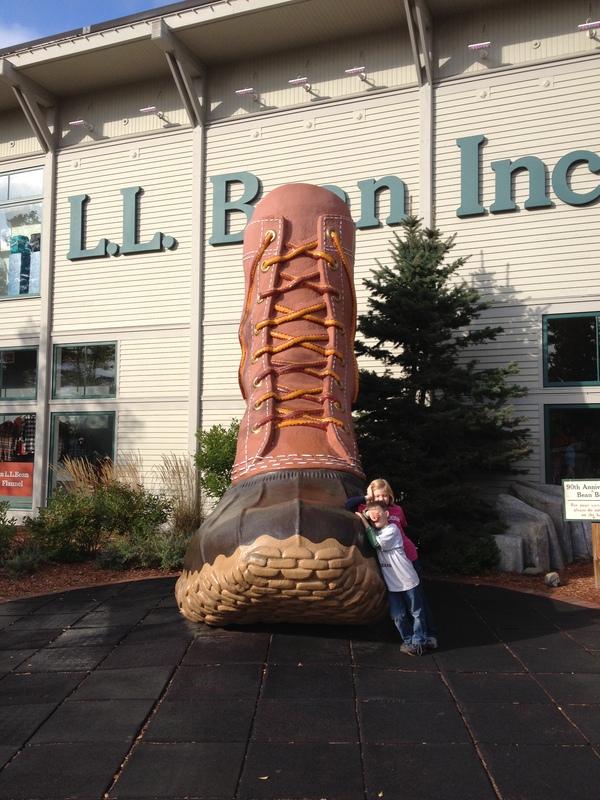 We love the cooler weather and therefore try to schedule a lot of mini adventures for the fall. Mix that with the start of school and new activities along with guests loving to visit New England in the fall, and our schedule fills up quickly! Thankfully we’ve been getting to do a lot of stuff we enjoy. I think I mentioned before that my aunt and uncle, Jan and Jeff, came to visit a couple of weeks ago. 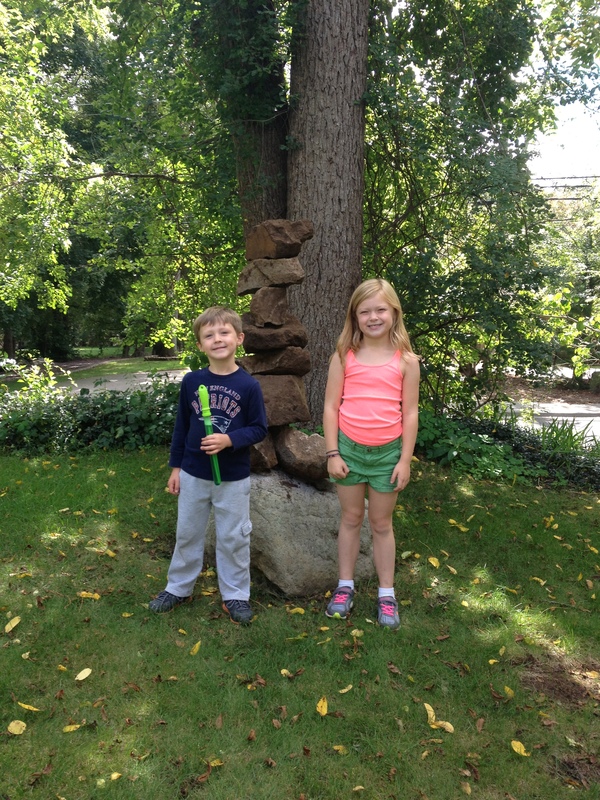 It was so fun to show them around Providence and Rhode Island and to just get to hang out. Since they live in Raleigh, it’s very hard for us to get down there now whereas when we lived in MD, it was an easy long weekend trip for us. We’re grateful they took the time to hop on a plane to visit! 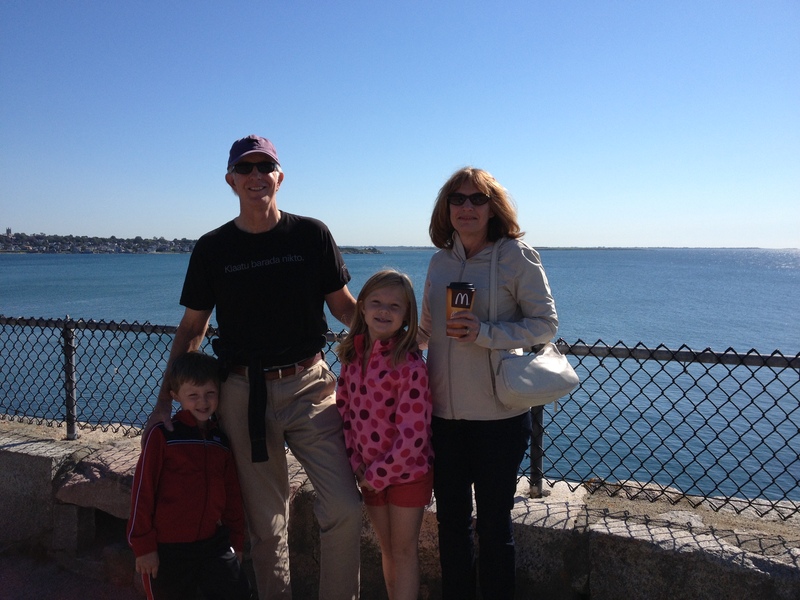 We had beautiful weather for the Cliff Walk in Newport! 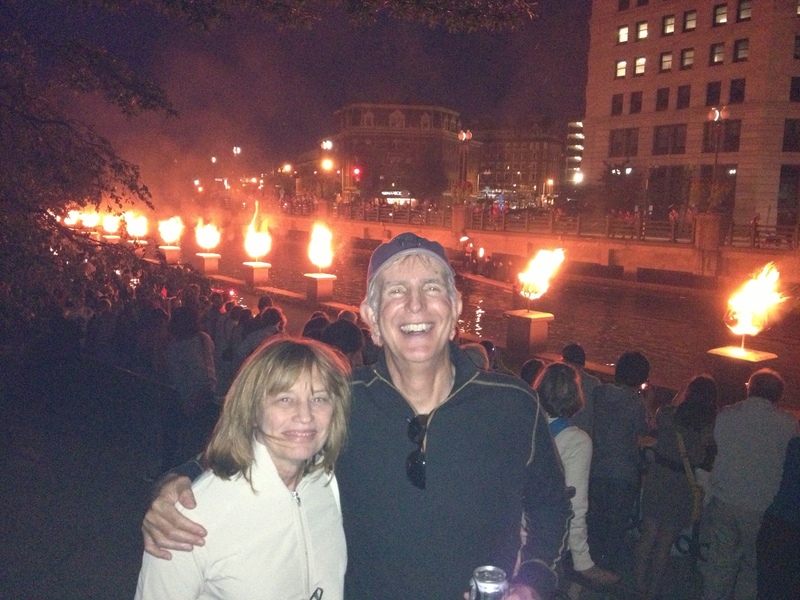 And we enjoyed some delicious desserts while watching WaterFire. It’s best to say we “ate” our way through Rhode Island with Jeff and Jan. We had perfect weather and even got to enjoy some volleyball and badminton in the backyard. After they tried to re-purpose our soccer goal as a net, I decided it was time to upgrade. So we found one of the last volleyball nets at Target, and Jeff and I had quite a time getting it up. Who knew it would be so complicated to put some stakes in the ground? The next weekend, we focused on our yard. After the gas company tore it up when installing the gas line, we had a lot of leveling and seeding to do. In the process, Jeremy pulled up quite a few stones. East Greenwich is a very rocky area! Jeremy probably could have dug and dug all day and come up with enough stones to build a wall. But he had to stop or else our whole yard would have been torn up. It was just enough stones to build this sculpture. I think we should charge admission, don’t you? 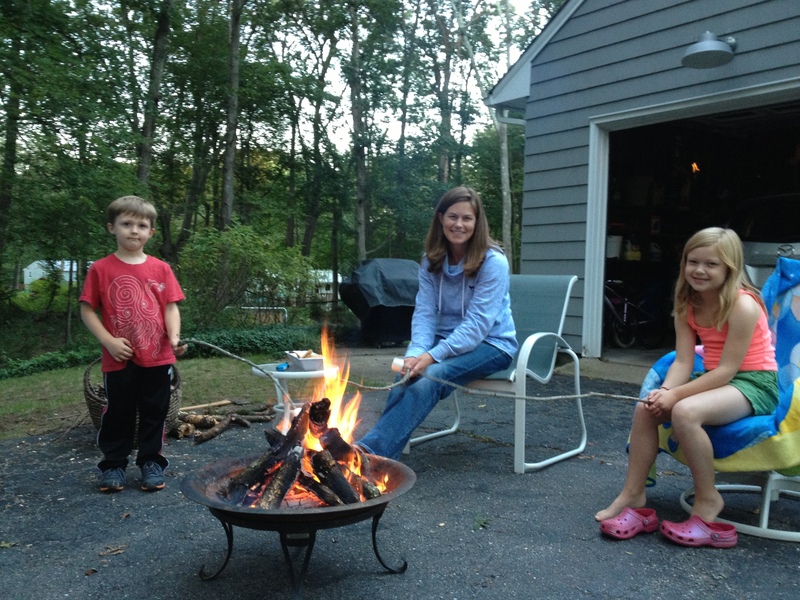 What is fall without a little campfire and s’mores? The kids really wanted to camp out in our backyard last weekend. I was up for it even though it would have been cold. But I also was relieved when Jeremy talked them into a sleepover in our bedroom instead. At the very least we could provide a campfire, though. The highlight for me, though, has to be our little getaway to Maine. My mom’s friends have a cabin up near Bristol, and they offered it to my mom and us for this past weekend. It was rustic, but a perfect place to lay our heads at night after enjoying all that Maine has to offer during the day. Unfortunately thanks to horrible traffic Friday night and a windy rainy Sunday morning, we only got out and about on Saturday. But we packed it in! 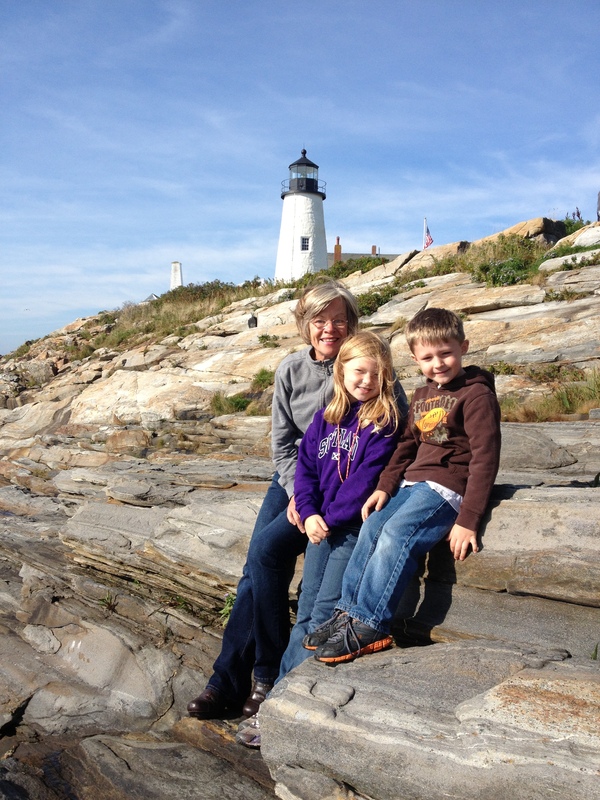 First for breakfast on Pemaquid Point and some amazing photo opportunities. 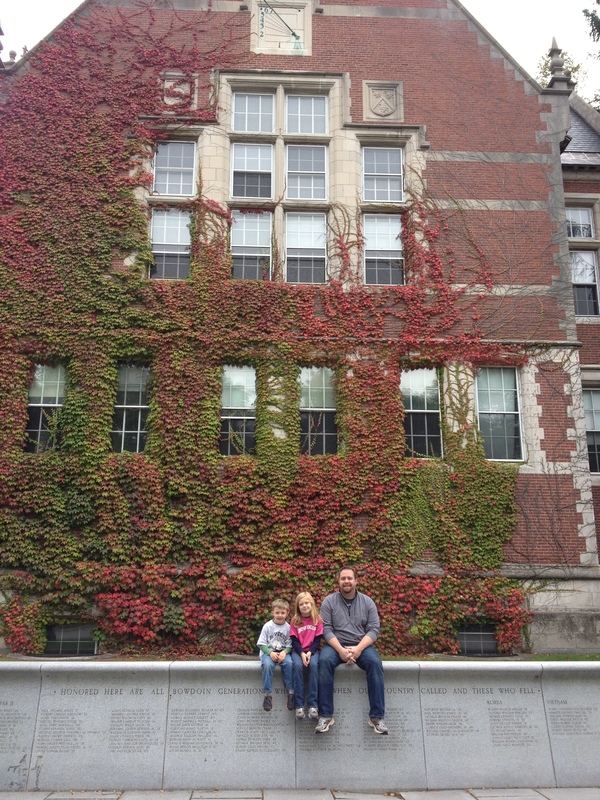 Then off to Brunswick to walk around Jeremy’s alma mater (Bowdoin) and take in their football game. A stop in Freeport was a must, followed by dinner at one of our faves, Gritty’s. It’s just one of those days where I need to write to get a lot off my mind. So here are the random bits of consciousness flowing through my mind these days. The kids started tennis lessons yesterday. (Both did great!) I have never seen so many neon shoes and clothes, though. Neon is definitely back when it comes to fashion. I’ll need my sunglasses. My aunt and uncle visited from Raleigh this past weekend. We ate our way through Rhode Island, experienced Waterfire, visited Newport, watched a lot of tennis and football and played even more volleyball and badminton. It was a great weekend, and we were so thankful to have them come see us! I did the Ab Ripper workout with my aunt on Friday, and I’m still sore. When will it go away? I got a new hairdryer a few weeks ago, and I’m not happy about it. I had my old one for a while, so we had a good routine in the mornings. Now I feel like I’m in a tornado with this new power of this one. My hair gets all tangled up, and it’s a workout just to do my hair. We’re doing a little weekend in Maine soon with my mom, and I can’t wait. Fall in Maine – love it!! Work is yet again in limbo. Wondering when I’ll ever feel secure in a career again. Since my oven has been back, I’ve baked/cooked blondies, brookies, cookies, biscuits, apple crisp, chicken noodle soup, pasta salad, and rice. It is so nice to have my full cooking repertoire back! Time for fall yard work! I think I’m going to be tired after this weekend. Our fall schedule is already filled up. How did that happen? Thanks for indulging me in reading about my random thoughts. Feel free to share yours in the comments if you need to! I’m back!!! Ok, well, I wasn’t gone really. Just a certain side of me was gone. My baking side, that is. After three months of living stove-free, I am looking forward to a truly home-cooked meal tonight (complete with rice from the stove, not one of the icky microwave packets!) And I will top it off with cookies, of course! 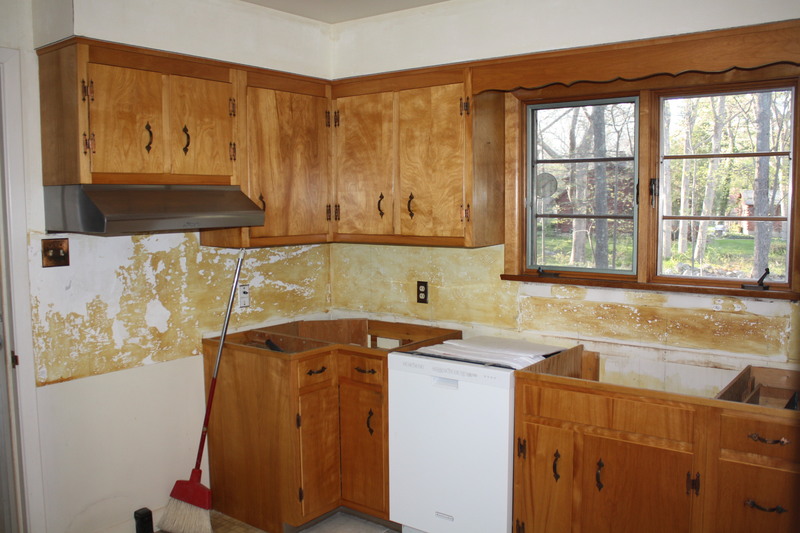 This kitchen makeover has been a test of my patience. It’s still not TOTALLY done, but I’ll get to that later. For now, let’s bask in this milestone! The makeover started before we even moved in. Our goal was to do a simple makeover that would make a big impact. 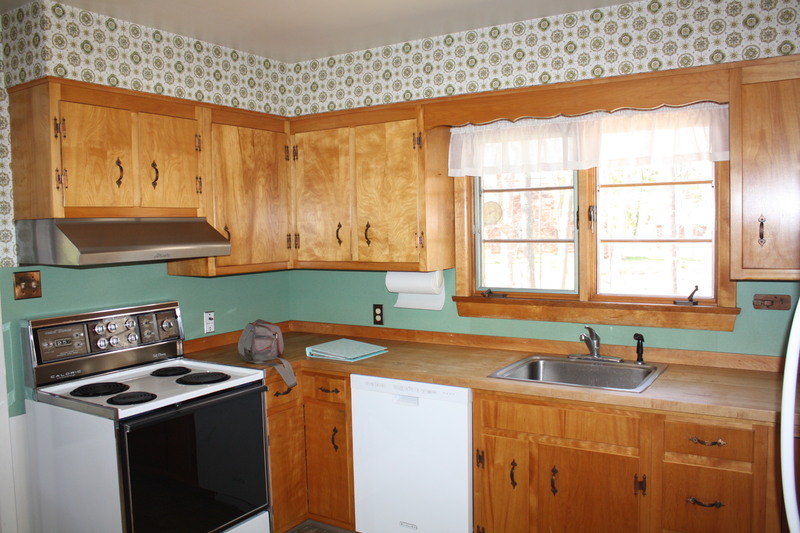 Our first inclination was to paint the cabinets white, but we chose to embrace the wood since we knew they were hand crafted by the previous (and only) owner. And they matched all the other wood in the house. 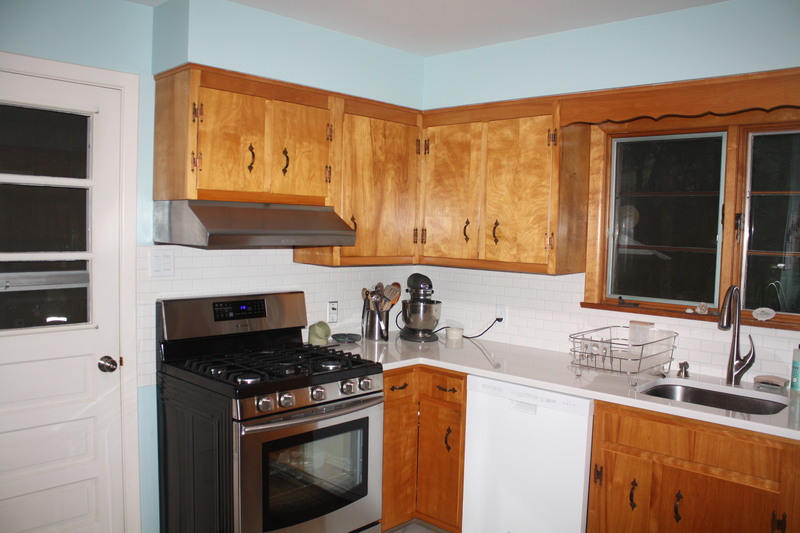 (And that tiny issue of knowing that we had a lot of other projects to get done, and painting cabinets would have taken up a big chunk of time.) So instead we decided to change every other aspect of the kitchen. First we removed the old stove and butcher block counters. (We’ve saved the butcher block and hope to incorporate them into a future project.) Jeremy redid the floor with vinyl tiles. We got a new refrigerator. We painted. 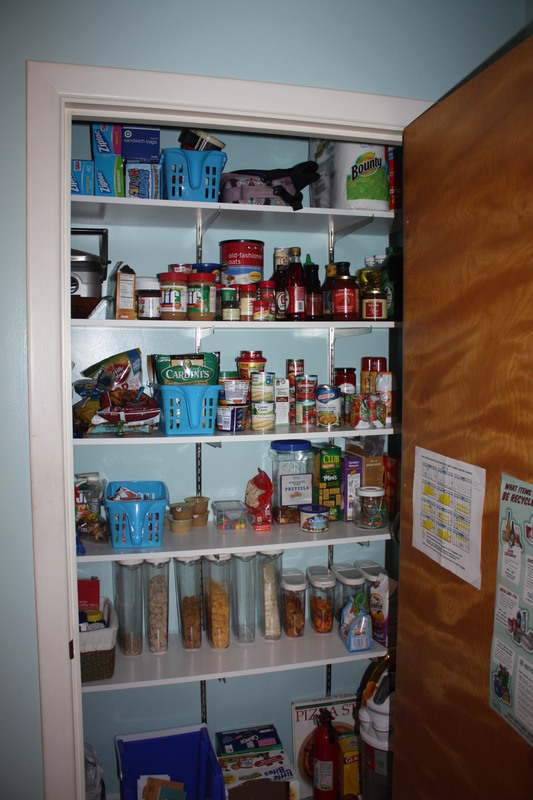 We tore out everything in the pantry and started over with fresh white shelves. And we had white Quartz counters installed with a new undermount sink and new faucet. The counter was the first hiccup. As in all home improvement projects, it took longer than expected to get them installed. We still moved in and lived without counters for about a week. Not too bad in the grand scheme of things. But like the rest of the house, once the counters were in, progress came to a halt. 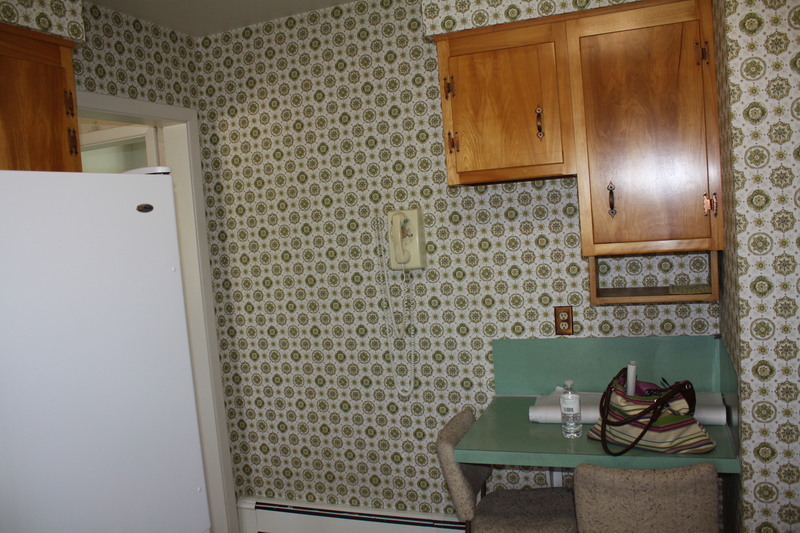 I stared at this ugly lack of a backsplash for months. 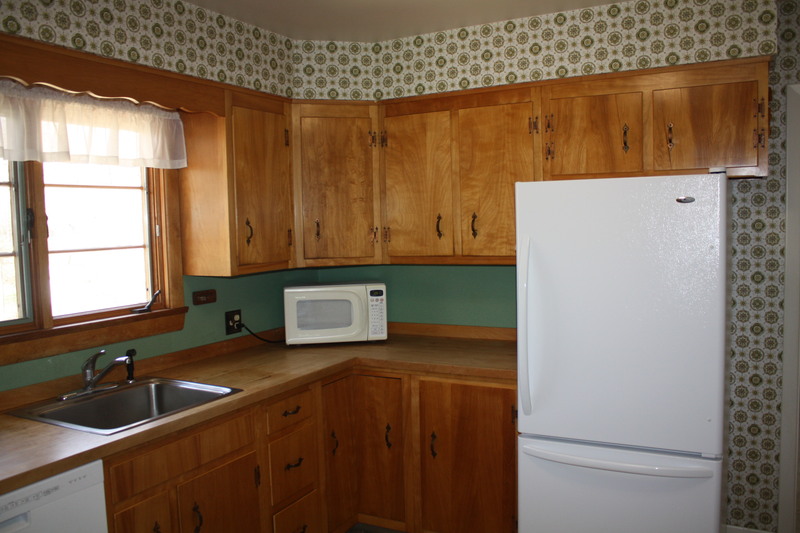 Previously there had been a teal linoleum backing, which Jeremy ripped out. He tried to get the glue off as well, but it was back-breaking work. I quickly told him to give in to the glue and hope that the tile mortar would just get spread right over it. 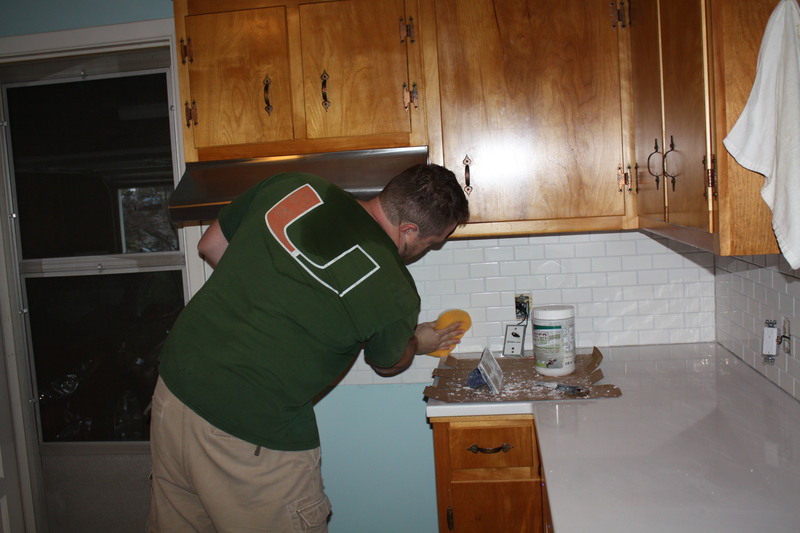 The unfinished backsplash really started bugging me about week 6. We wanted to get it done, but we were intimidated and unsure of how long it would take. Finally, Jeremy decided to dive in. He was on a roll and finished most of it over two days. It made such a difference! Soon after the backsplash was “finished,” we had our new gas stove delivered. The kitchen felt mostly complete. While we didn’t have the big gaping hole to stare at every day, we still had to wait until the kitchen was fully functioning. It was just a continuation of the waiting game. Waiting for the gas to be brought to our house from the street. Last week the big day finally came! (and the introduction of yet more work after the utility company completely tore up our yard!) And within the past two days, they have hooked up our stove, installed our new hot water heater and our new 95% efficient gas furnace (and removed the ugly old oil tank!) It’s been quite a busy week, but some home-baked cookies can certainly make up for it! My favorite parts are the refrigerator and stove and my big pantry. But like I said above, there are still some things to get done. 1. Seal the grout on the backsplash. 2. Clean the cabinet hardware or replace. 3. Update dishwasher to stainless steel. 4. Add under cabinet lighting. 5. 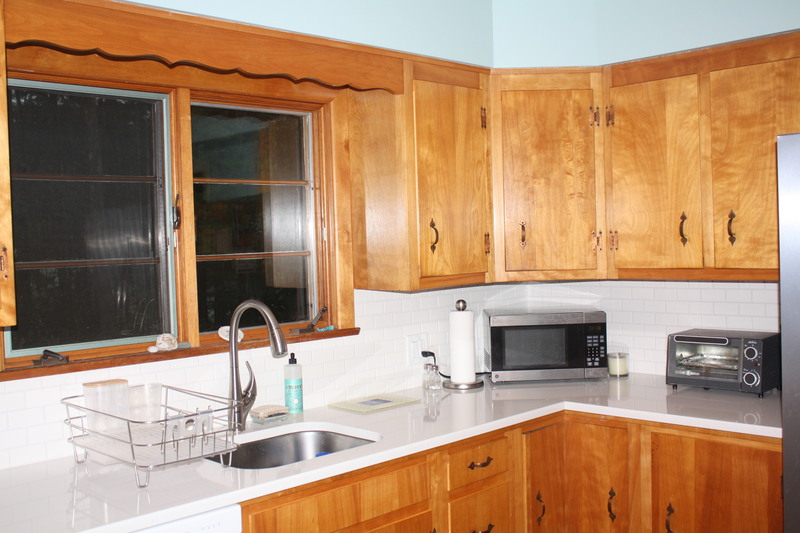 Modernize or remove scalloped trim board above sink. 6. 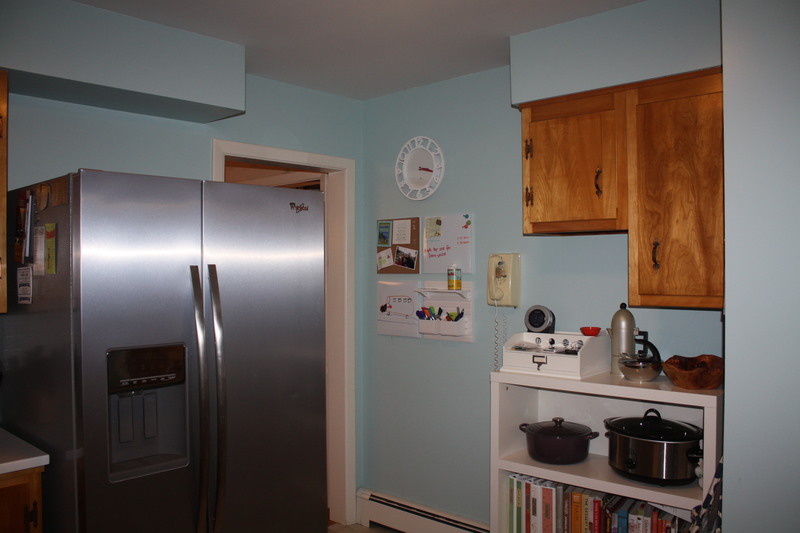 Figure out how to accessorize or use the space above the refrigerator. This is where I need your advice. There used to be a cabinet above, but with the new taller refrigerator, we had to remove it. Now there is a big blank space. What should we do with it? Help!